The comments in the most ridiculous parking sign story got me thinking, which is never a good thing. Why are we stuck with static signs stacked end-on-end? What if these signs could change throughout the day depending on the time and regulations? Enter the solar powered e-ink display. Now before I get started, I should point out that this isn't a one-size-fits-all proposition. Most signs work just fine. They're simple, relatively inexpensive, and reflective. This e-ink thing is just for the odd (although semi-frequent) parking area where a combination of loading zones, street cleaning, farmer's market hours, or whatever restrictions apply and change over time. So with that caveat out of the way, I think this could work. 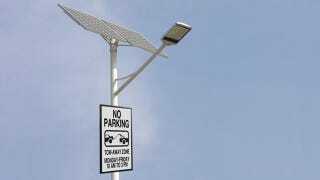 We already have dozens of cities using solar powered streetlights, and tapping into that juice could provide the limited power necessary to keep an e-ink display going. And it really doesn't take much. E-ink uses a fraction of the energy necessary to power a traditional LCD, and only requires a charge when switching between states. Even large e-ink signs use fractions of a watt to work, which is why your thin Kindle can display the same page of text for weeks on end with a small battery, and that low power consumption makes it great for everything from phones to watches to massive information screens. Waterproofing these signs should only involve a tight enclosure and a clear cover, and since backlit e-ink poses its own challenges, rigging up a few strips of LEDs around the outer edges of the sign could provide sufficient lighting. The cost of e-ink has gone down as well, particular in the last 10 years, and if these signs are adopted by hundreds of cities, the price of the controllers and displays could drop even further. Yay economies of scale! Sure, they'll be more expensive than a standard metal sign, which generally run between $100-500, and there's always the threat of theft (and think of the hacking possibilities). But for the rare instances where cities need to employ three, four, or 12 signs in one area, that cost could be easily mitigated. Or it's just dumb. I'm sure you'll let me know either way.